Why do parachutes have holes? Parachutes are designed to create as much drag as possible. So why do parachutes have holes in them? When a human falls to earth (whether silently like Wile E. Coyote or while issuing the famous Wilhelm Scream), the earth's gravitational pull accelerates them faster and faster. In a vacuum, this would be the only force working upon them. Since most people on earth don't fall through a vacuum, gravity isn't the only force at work on them. The faster they move, the more quickly they're shoving down air molecules on their way to the ground. Those air molecules provide a counter-force to the push of the body against them. This counter force is air resistance. The faster gravity accelerates the person, the more air resistance they encounter. The more air resistance they encounter, the slower they fall. Eventually an equilibrium is reached between the downward acceleration caused by gravity and the upward push caused by air resistance. This is called terminal velocity. It's the point at which a body will fall no faster. For a free-falling human without a parachute, terminal velocity lives up to its name in more ways than one. Few people survive a long fall to the ground. Enter the parachute. It spreads out over a huge area, causing a falling person to displace much more air as they fall. Since more air molecules are being shoved down by the fabric of the parachute, the parachute – and the person attached to it – get pushed upwards in return. The equilibrium of terminal velocity is once again reached, but this time it's a velocity that's survivable. All because of the drag of the parachute. So if that drag is so important, if pushing down as much air as possible is the key to slowing a fall, it doesn't make sense that round parachutes have holes in them. The holes let air slip through and continue on its way without slowing the jumper down. It's easier to understand why parachutes have holes when observing laundry hung out on a line on a windy day. A large sheet will be pushed upwards by the wind. Gentle breezes make it billow at the center, looking a little like a parachute. When winds pick up, the sheet will start to move more erratically. First the one corner, then the other, will flip outwards in the wind. This will make the sheet start twisting one way, then another. The more violent the wind, the more the sheet will twist, as each corner in turn flaps out to relieve the pressure from the wind. This looks peaceful enough if watched from one side. If watched from below, it's more ominous. If air can't easily move in a way that won't disturb the billowing shape parachute, it will rush out one side, then another. 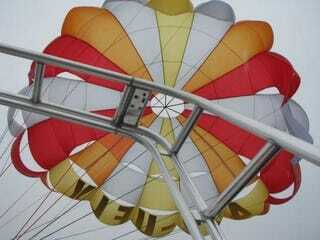 This will make the parachute twist unpredictably, and make it hard for the parachute operator to control the jump. If the twisting gets bad enough, the parachute will collapse. The sides will flip up and then central bulge will snap shut like a fan, leaving the jumper in free fall with some string and loose fabric attached. Building in a weak point that can be controlled is better than insisting on invulnerability that can't.